The buildup to the release of Avengers: Infinity War was filled with anticipation. Which characters were going to come face to face? Who would die and who would survive? Was it a one part or two part movie? For Scottish viewers there was also the excitement of seeing Edinburgh as a backdrop – however fleeting – to the majestic mayhem of the superheroes and villains. In a scene which lasts roughly five to ten minutes, actors Paul Bettany and Elizabeth Olsen (as Vision and the Scarlet Witch respectively) are set upon by the children of Thanos and crash around locations in and off the Royal Mile, including Waverley station (and even mention catching a train to Glasgow). It’s minute – the location card simply reads ‘Scotland’ – but those who witnessed the filming in 2017 have a payoff. The film as a whole is something created from years and years of buildup. All the main heroes come from their own franchises, all have their own stories and personalities and here they collide to fight against the unstoppable and perhaps even sympathetic force of Thanos (Josh Brolin). If he manages to gather all six infinity stones together, half the galaxy will be wiped out with a click of his fingers. It it certainly a spectacle to behold, and there are endless moments of incredible action that are sure to delight fans. Character development is very limited, but if you’ve seen the entire Marvel filmography then you already know these characters inside out and thus have no need for it. For the casual viewer, it means the intended sombre and heart-wrenching moments fail to have as much impact. Performances are uniformly good. Robert Downey Jr (Tony Stark/Iron Man) and Chris Hemsworth (Thor) wear their roles like an old pair of jeans, comfortable and familiar. But even the new kids on the block, such as Tom Holland (Peter Parker/Spiderman) manage to score memorable moments. 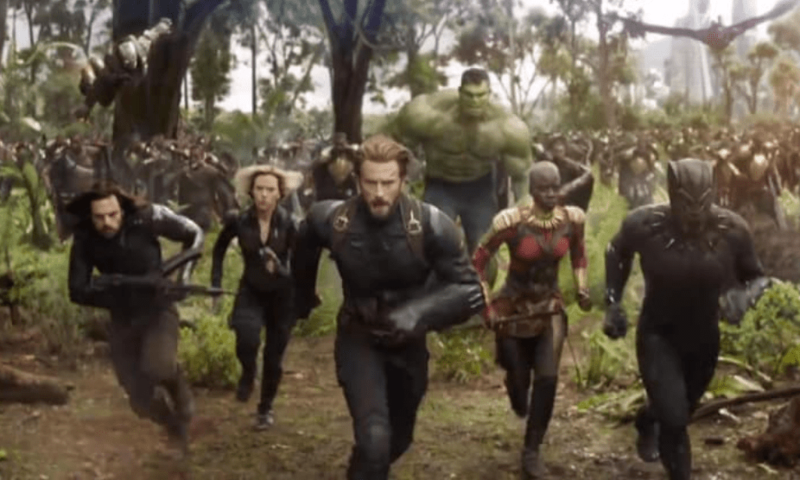 Perhaps things sometimes move too fast, and maybe it’s a little jarring tonally from one scene to another (which is all that can be said without spoiling things) but overall Infinity War is very entertaining and surprisingly to the point of having such a large cast. A runtime of two and a half hours for superhero shenanigans, plus a wait for a bonus scene after the credits roll, might be considered pushing it, but Infinity War is rarely boring and will surely be a big hit with the fans.